Chrichton's World: Review Finding Dory (2016): A genuine attempt in telling a new story which is quite rare for sequels! Review Finding Dory (2016): A genuine attempt in telling a new story which is quite rare for sequels! When I found out that a sequel to Finding Nemo was in the works I was quite skeptic. I mean even the title indicated that this would be nothing more than a cash in. 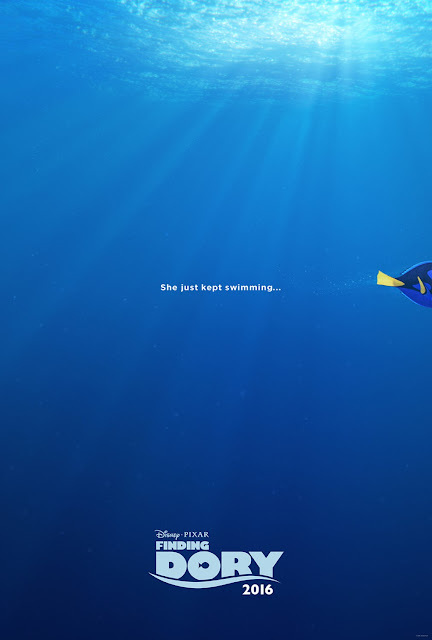 But I am here to report that Finding Dory is anything but. They actually tried to do something really meaningful. It sacrificed some of the comedy and goofy antics of the original in favour of a heart wrenching tale that believe it or not is very relevant. Without ever saying the terms this animated film is about memory loss and horrible diseases like Alzheimer's. It gives us a glimpse of what it could be like and how people react towards it. Maybe some of the elements are lost on they young ones but considering the complexity I think Pixar did a good job of explaining to the audience what it could entail and how to deal with it. There are several moments where the film pulls at your heartstrings in full force in a very touching and sincere way. Because you see these moments while being depicted by this lovely fish called Dory are as real as they can get. Of course Pixar can't shake the typical Disney tale that is repeated and rehashed ad nausea. Big deal? If it moves you and keeps you hooked until the adventure is over you have a good film on your hands. How can anybody then use criticism that it is not doing anything original? Because I just told you it did. Only it did it in a way that it wasn't too obvious. Sometimes I really wonder if any of these people who are always so negative actually know what they like. Honestly you should really ignore the negative reviews since Finding Dory is well worth your time. It might not be as comedic as it's predecessor it still is full of chaotic and fun mayhem. Enough funny and colourful characters like Hank the Octopus (Ed O' Neill) and certainly a lot of action and spectacle. Do I really need to tell that the CGI animation is done superbly? It's Pixar. They can't do wrong. So overall you really should give this a shot since it's one that is sincere, genuine and entirely delightful.